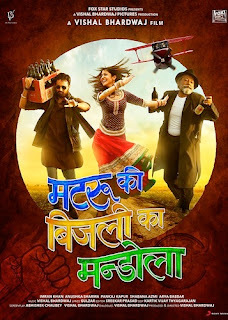 Matru Ki Bijlee Ka Mandola is an upcoming Bollywood comedy movie written and directed by Vishal Bharadwaj. The film stars Imran Khan, Anushka Sharma and Pankaj Kapur in the lead roles, while Arya Babbar and Shabana Azmi will appear in the supporting roles. The film is all set to release on 11 January, 2013. The film is a comedy-drama about Harry Mandola (Pankaj Kapoor), a wealthy industrialist who loves his drink, his daughter Bijlee (Anushka Sharma) and the unusual bond they both share with Harry's man Friday, Matru (Imran Khan). Music is composed by Vishal Bhardwaj with lyrics by Gulzar,the music is on Sony Music. The title song is by Sukhwinder Singh and Ranjit. The title song was released as a single track on 30 November,2012. Another single track called "Oye Boy Charlie" was released on 12 December, 2012. It is sung by Rekha Bhardwaj, Mohit Chauhan and Shankar Mahadevan. The full album is expected to release by 15th - 16th December 2012.